During the Prohibition Era in the United States (1920–1933), bootleggers would modify their cars to make them run faster than the cars of revenue agents and other law enforcement, and this can be seen as a predecessor of the hot rod hobby. 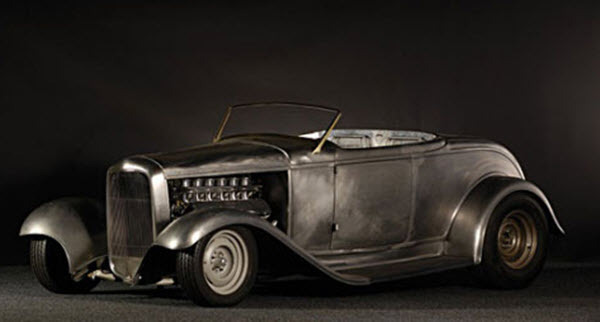 The oldest known uses of the term hot rod is from the 1930s, when car owners in southern California, USA would modify their cars and race them on the huge, dry lake beds located northeast of Los Angeles. In 1937, the Southern California Timing Association (SCTA) was formed in an effort to standardize the rules for land speed racing events. The origin of the term hot rod is unclear, but it might have something to do with replacing the camshaft of a vehicle with a “hotter” version – a hot stick or a hot rod. During the early days of hot rodding, the cars used were often Fords, especially the Model T, the Model A and the Model B. Roadsters were light, could be purchased fairly cheap and wasn’t overly complicated to modify. They were chiefly modified to decrease weight and the wheels and tires were changed to improve traction and handling. Sometimes the engine was tuned or replaced with a more powerful one, and the car body could also be channeled (lowered over the frame). Examples of items that were frequently removed from early hot rods (or speedsters or gow jobs as they were also called) are hoods, bumpers, convertible tops, fenders, and windshields. After World War II, a lot of soldiers returned home to the United States after receiving technical training in the service – training that they could use to modify their cars. Simultaneously, many small military airports throughout the United States were abandoned or semi-abandoned and could be used for hot rodding events. Access to a dry lake bed or similar was no longer required to hold a relatively safe hot-rod race away from normal traffic. In the 1950s, hot rod enthusiasts started focusing on not just improving speed and handling, but improving the appearance of their cars as well. Eventually, distinctive paint jobs became common for hot rods. Many hot rod associations were formed throughout the country and magazines were launched for hot rodders. The National Hot Rod Association (NHRA) was founded as early as 1951 to provide a governing body for drag racing. The first NHRA sponsored event was The Nationals, held at the Great Bend Municipal Airport in Kansas in 1955. In the 1950s, engine swaps for hot rods often involved fitting the Ford flathead engine with crankshafts of up to 4.125 inches (and for some cars even more!). It was also popular to bore them out by 0.1875 inches to 3.375 inches. This practice eventually fell out of favor due the increased risk of the block to overheat and crack. In the 1960s, the Ford flathead engine was largely supplanted by the early hemi engine from Chrysler. In 1963, New Journalism trailblazer Tom Wolfe’s essay about hot rods was published in Esquire magazine under the attention grabbing title “There Goes (Varoom! Varoom!) That Kandy-Kolored (Thphhhhhh!) Tangerine-Flake Streamline Baby (Rahghhh!) Around the Bend (Brummmmmmmmmmmmmmm)…”. This essay was later included in the 1965 book The Kandy-Kolored Tangerine-Flake Streamline Baby, a book largely credited for helping to bring mainstream attention to the importance of hot rodding in popular culture. The late 1960’s and early 1970s wan era when major automakers began offering cars that didn’t need any modifications to be high-performing. Interest in hot rodding waned as it became possible to simply purchase a “muscle car” straight from the assembly line. After the 1973 Oil Crisis, the major automakers shifted focus from “muscles” to fuel efficiency and this prompted a new interest in privately tinkering with your car to make it faster. Now, the small-block Chevy was dominating the hot rod scene. While hot rods had earlier chiefly been created for races, the muscle cars of the late 1960s and early 1970s had gotten the public used to having a high-performance everyday car. The cad mod scene of the 1970s was therefore less focused on racing and more focused on creating “street rods”. 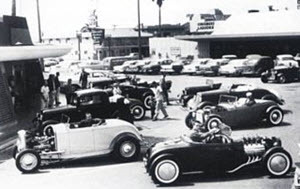 Street rodding was largely a family oriented hobby with national events being organized by the National Street Rod Association (NSRA). In the 1980s, the popularity of the small-block Chevy waned in favor of the 350 cubic inch Chevy. Hot rod enthusiasts also discovered that the all-aluminum 215 Buick (or Olds) could be stretched up to 305 cubic inches using the Buick 300 crack together with new cylinder sleeves and various parts that didn’t come from GM, including the Carter carb and VW lifters or Mopar lifters. High-compression cylinder heads from the Morgan +8 also became popular during this time. Examples of countries where a hot rod culture grew parallel and in conjunction with the one in the United States during the 20th century are Canada, Australia, United Kingdom, Sweden, and Finland. In each country, the hot rodding hobby was forced to adapt to local conditions when it came to the availability of cars and parts, the legality of custom cars, and so on. One example is Sweden, were the law up until 1982 required custom-built passenger cars to pass a crash test. This made the domestically manufactured Volvo Duett chassis popular among Swedish hot rodders, since it was often possible to get the car legalized as a “rebodied Duett” rather than a new and completely custom-built vehicle.